We offer a wide range of customisable add-ons for your website, ranging from content management systems (CMS) and databased content to secure online applications and e-commerce solutions. Examples can be found in our portfolio. Hosting with Chirp will give you access to advanced traffic analysis programs so that you can see exactly who is using your site, including enhanced Webalizer reports and our own Search Engine Traffic reports. Ongoing assistance and feedback to help make your website a success. Feedback and consultation to ensure that what you get is what you want throughout the process. Support and advice in maintaining and updating your website. Advanced Search Engine Traffic reports. Hosting of unvetted (by us) third-party PHP, CGI or similar applications. any activity adversly affecting other clients or compromising server security. In all cases discretion will be applied and any action will be preceded by at least one warning. Chirp provides hosting for your website and database as well as a secure administration interface allowing you to update content and view reports. In the graphic below, those items for which Chirp is responsible are highlighted in orange. For other items we provide advice and assistance. Once you have registered a domain name, your DNS and Mail settings can be managed either with Chirp or on your own servers. In any case you will be responsible for any mailboxes (where your email is stored). These can be hosted with your ISP, a local network, or a (free) webmail service such as GMail. All Chirp servers run Apache on Debian GNU/Linux. 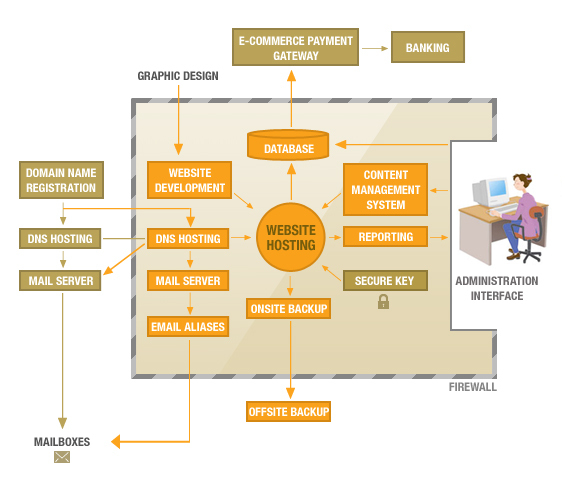 For dynamic website we are using PHP with PostgreSQL as the back-end database. We also use a number of other modules, most of which you can find listed under Useful Links. We have chosen these packages because of their reliability and stability. We believe that these 'open source' products are more reliable and provide greater functionality than competing commercial packages. Apache is used on 70% of web servers world-wide. Most of those servers are now running the PHP module which means that PHP is installed globally on over one third of web servers - and increasing at a rapid rate.